But for all that some of the arguments for physician-assisted suicide are convincing, this article by Ezekiel Emanuel continues to give me pause. Emanuel shows that unbearable physical agony is almost never the reason patients give for seeking euthanasia…. Depression and other forms of mental distress — which are, of course, a sort of pain — are by far the more common motivator. can no longer afford to treat their suffering….That may seem alarmist now, but give euthanasia 15 or 20 years to become commonplace, and abuse, or at least overuse, is much easier to imagine. I want to make a couple of points, one practical and one a little more philosophical. Emanuel’s piece is 14 years old and I don’t know if he’s changed his views in the meantime, but on its merits I didn’t find it nearly as persuasive as Ezra did. 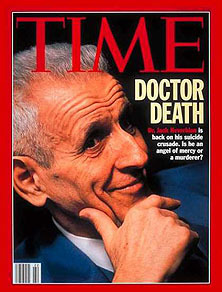 On a practical level, Emanuel argues that the experience of the Netherlands, which effectively decriminalized assisted suicide in the early 80s, demonstrates that not every physician follows the rigorous rules that have been set up to insure that assisted suicide is available only to those who genuinely want it and are of sound mind. But in fact, the numbers he cites are fairly small and not especially troubling. Only about 1% of Dutch deaths are assisted, hardly a tidal wave; most violations of the law are minor; and there’s very little evidence that there’s any serious level of abuse going on. It’s trivially true that no human set of rules will ever be perfect, or perfectly followed, but falling short of perfection is a poor argument against how the Netherlands handles assisted suicide. In fact, the evidence suggests that they’ve done quite a good job of policing themselves on this front. If you don’t want to die, nobody in the Netherlands is prodding you to do it anyway. On a more philosophical level, the bigger issue here is the existence of a slippery slope: once assisted suicide becomes widely accepted, doctors and loved ones might start coercing dying patients into accepting it. It would be foolish to pretend that this an entirely ridiculous concern, but there’s a good general rule to follow when you think about slippery slope arguments: does the slippery slope work with or against human nature? The former are far more dangerous than the latter. For an example of the former, think about the torture of terrorist detainees. If we allow it in a few cases, is that likely to lead to a slippery slope in which we torture more and more prisoners? I think that’s a real concern: millennia of human history demonstrate that jailers routinely torture their prisoners unless there are extremely strong, bright line rules against it. It is, unfortunately, pretty universal behavior If you break the taboo against it, you unleash that dark part of human nature, and once unleashed there’s a very stong likelihood that it will feed on itself and get continually worse. That’s why keeping this hard-won taboo in place is so worthwhile. But what about assisted suicide? If it’s legalized and becomes accepted, will it lead to doctors and family members trying to get rid of old and dying patients? In some cases, yes: the world is full of bad people, after all. But how likely is this to become a widespread problem? Not very, I think, because it flies against everything we know about human nature. Hollywood potboilers notwithstanding, family members don’t generally want to kill off fellow family members, and that goes double for actively killing off parents. There are always going to be a small number of cases where this happens, but with even minimal safeguards in place it’s simply not likely to ever become a major problem. So the arguments against assisted suicide still seem weak to me. What’s more, as with all proposed policy changes, you need to ask the question: compared to what? Will there be abuses of assisted suicide? Of course. This is the real world we’re dealing with. But our current system of caring for the elderly already features massive, gruesome, systemic abuses. These abuses aren’t hypothetical, they’re real. The chances that a properly constructed assisted suicide regime would produce worse results strikes me as slight.